Some games are iconic, classics that are worth revisiting and bringing to a new audience. Okami is a prime example. Back in 2006 this was one of the PlayStation 2’s best games – a uniquely creative action, platform, and puzzle RPG with an incredible visual cel-shaded style. Now ten years later and enhanced in full HD (including 4K on the PS4 Pro), the game shines brighter than ever. You play as a sun goddess named Amaterasu, who, in the form of a white wolf with celestial markings, takes on a variety of Japanese mythological demons in a quest to bring life back to the world. The story is drawn from Japanese Shinto mythology and is a full-length adventure with over 40 hours of engaging gameplay and several different story arcs. 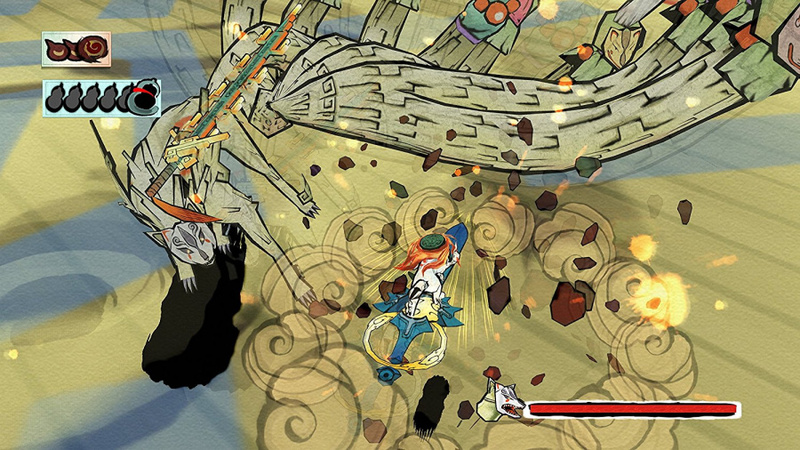 It also packs some innovative gameplay mechanics such as equipping your wolf avatar with a Celestial Brush – a gesture-based system used to perform "paint miracles" such as adding missing details to the scenery or cutting through obstacles. With a gameplay that riffs on classic Zelda like adventuring and treasure hunting, your quest is to restore the world by destroying monsters who have stolen the colour from it. The impact of Okami can be seen in many games including the gorgeous Flower and Tearaway which both borrow from the creativity found here. Being a powerful white wolf deity certainly has its perks, as you work through the various areas of the world, killing monsters, solving problems, and helping the people you meet; they will in return start to worship which allows you to become more powerful and add new miracle abilities to your repertoire. There are often positive options other than just attacking everything you meet. For example, you can choose to feed other animals that you meet such as birds and rabbits, and being a friend reaps rewards in the karma they bless you with (which you can use to power up your stats). The eye-popping hand-drawn ink and watercolour style looks amazing in HD, and really captures the zen feel of ancient Japan, while the control scheme is both easy to pick up and yet allows for some complex gameplay options. All the action plays out on an interactive canvas, and onto which you can paint using your Celestial Brush. A quick press of R1 freezes time and allows you to draw things which will progress your quests be it to repair wrecked machinery, slow down time, bring forth gusts of wind, make water burst forth, or deliver an explosive surprise by creating bombs. Having a Celestial Brush soon becomes second nature as you can do things like change night into day by drawing a sun or moon, bring various aspects of the landscape to life, or create yourself a boat-like lily pad to sail over water or chop life giving fruit from high branches. In combat the brush can be used to slash through enemy shields allowing you to deliver a killing blow or deflect an enemy’s projectiles back at it. There are plenty of brush techniques that you learn along the way (by meeting celestial brush gods) and each is incorporated effectively into the gameplay. Because the Celestial Brush is so powerful, the ink for drawing is limited by the amount available in special ink wells, which stops you solely using Brush techniques to defeat enemies; when you don’t use the brush, however, ink is restored over time. The combat is a satisfying mix of button mashing and brush wielding – different enemies require you pick the right tactic to take them down. Each battle is assessed in terms of time taken and damage dealt, and bigger monetary rewards are granted for better performance. Battling well and earning money (Yen) allows you to buy items from merchants that can enhance both your offensive capabilities including healing goods, better weapons, tools, and key items for completing quests. 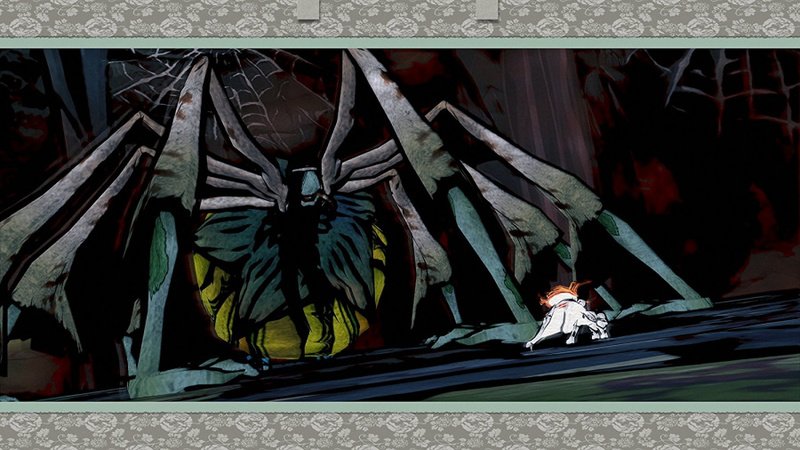 Okami pays more than passing homage to traditional Japanese folklore, and has some winning humour which hasn’t lost its amusement in translation. Much of the humour comes from the host of side characters you meet along the way but is also often kicked off by Issun – your tiny insect sized travelling companion who will often speak for you (as even though you’re a God you can't actually speak apart from barking to get attention). The plot of the game delivers a nice succession of surprise twists which keeps you engaged as you travel through countryside, scale a crazy tall tower, visit an underwater sunken ship, and even get to venture into the inside of a huge beast. Each new dungeon that you visit won’t break you as the level of challenge is well balanced but they're almost always satisfying to explore and loot. 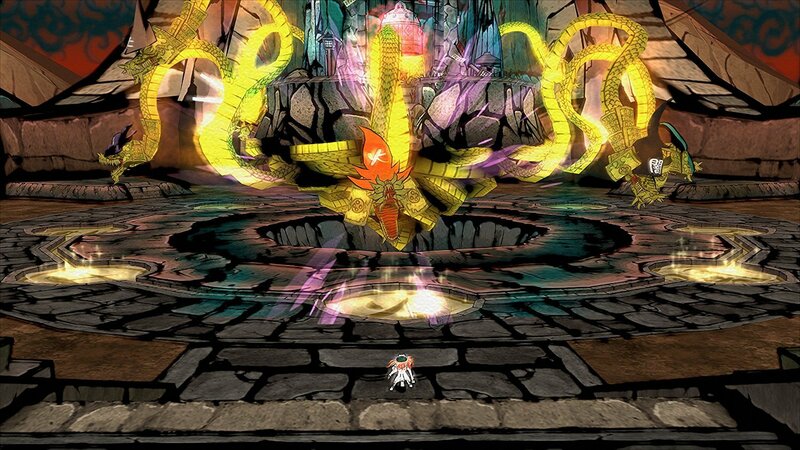 The boss battles are cool too and require different strategies and brush work to overcome. There are plenty of side-quests and challenges to take on along the way too, and with only minor quibbles such as a slightly unwieldy camera during fights and a missed opportunity to utilise the DualShock 4's touchpad for the brush strokes, this is an easy recommendation to make to anyone who appreciates quality game design. 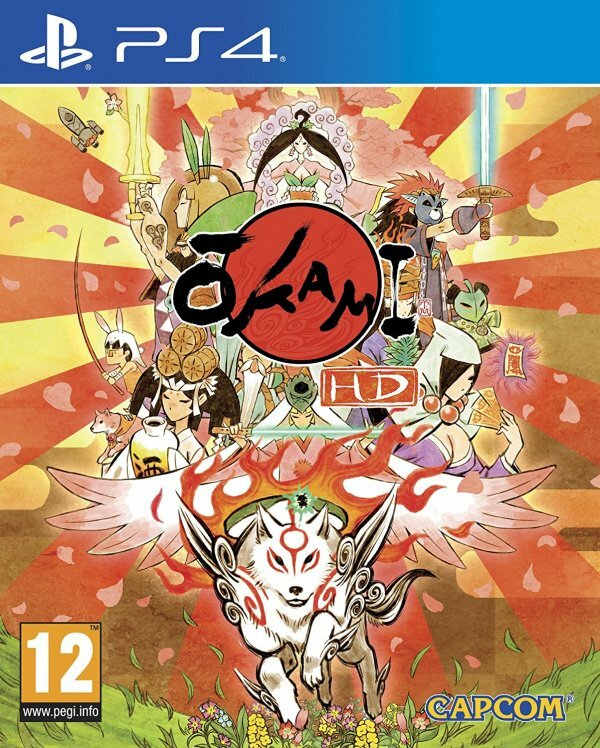 Okami was my most favourite PS2 game! Glad to see that this remastered version is a good one. Played a big chunk of it on the Wii and I absolutely loved it, albeit the motion controls for the Celestial Brush could be very wonky (which is one of the reasons for why I stopped playing it). I'll hopefully be picking it up again for the PS4 to experience it as how it was experienced on the PS2. And the price is very reasonable (€25 for a physical copy!) for one of the most underrated games ever. I got my copy today. I hope the controls are good. The Wii version was a bit finicky at times, and I can only imagine that the pointer controls are the superior controls. Shame to see the touch pad isn't supported. I can't believe they didn't utilise the touch pad for brush strokes! I wonder if they will patch in support? As someone who has never played Okami and is going to be getting a PS4 soon, I am glad this has reviewed well and I'll get to experience it for the first time in its best form. Same goes for Shadow of the Colossus too, can't wait! EDIT: Actually I've just ordered it from Amazon as it was only £13 with Prime Discount. I am definitely preferring Playstaion game pricing over Nintendo game pricing! My copy should be arriving tomorrow. Never played Okami before so I'm pretty excited. R1 freezes time. So how do you draw? Touch pad or analog sticks? I loved it on PS2 and PS3 so I'm sure I'll love it again on PS4. I best get practicing my bomb drawing technique. I’ve never played this and it sounds up my alley. Gonna have to give it a try. Hmmmm ... this or Shadow of the Collosus? Great review!So glad it has a high score because it's a game I missed on the Ps2 (have no idea how) and I'm really excited to have a chance at playing it. @Th3solution Shadow of the Colossus. @Octane Yeah, as far as replaying a remastered PS2 classic, I was leaning toward SotC also. Of course both are worthy of playing at least once, but some gamers may have to prioritize, and having played both years ago, I wonder which stands the test of time the best. @GravyThief You're in for some treats, man! This game is a masterpiece! There's no other game like it and I loved the art style, the world, the fighting system...I wish they would make a sequel! @Th3solution I'm playing it right now, and it was only 20 quid, but it just like I remember it. Whereas SOTC looks like a completely new game. Both are good games, but I'd pick the SOTC remake over Okami HD any day. Beautiful stuff. I forgot this was happening, saw it for $20 and just had to pre-order. Okami was one of my most hyped games ever before it came out. Then I bought it and it became my greatest gaming disappointment of all time. Cannot wait to play this again, don't even mind replaying the seventeen-hours-long last boss. no word on what they changed from the PS3 version which was already in HD? seriously? PS3 had Move support, which I think will be sorely missed on PS4. Not even sure if the Rez is higher on base PS4 either. That Spider Queen still gives me the shivers. Hmmmm if I remember correctly this was on ps plus for the ps3. I downloaded it as it was being raved about and gave up after an hour. It just seemed to be a never-ending stream of expository text boxes. Does it open up after a while or remain heavily text driven? 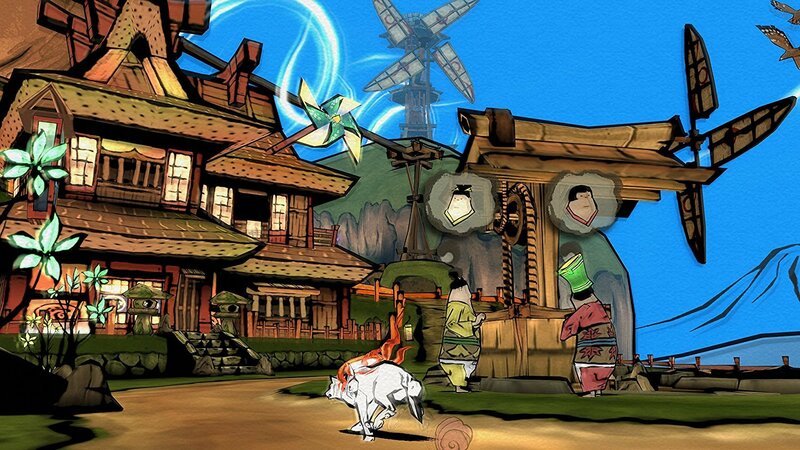 Love me some Okami. I remember trying it way back on the Wii and I enjoyed it but never went back to it after a few hours. Then last fall I decided to get it on the PS3 and play it and I had an absolute blast playing, beating and getting the platinum. For $15? Hell yea I'll buy it again on PS4. Picking this up tomorrow. I don't have any time to play this now but for only $16 I HAVE to buy it day 1. I'm interested, but will probably wait for a half off sale in the future. Unfortunately, this game is still running at 30fps — the developers were unable to get it working at 60fps due to various complications with the animations... that is quite a shame indeed. as that is the case, i will stick to the ps3 version which i already own as there is no real improvement to be found with the ps4 version (unless you have a 4k tv). The beginning is very text heavy but then it eases up. I guess I can stick to my PS3 version as I dont have a 4K TV. Had this on Wii, but I never beat it. Looks like I’ll have another chance. Just a heads up for anyone that got the platinum on ps3, you won't earn any trophies on the ps4 as both versions share the same list. @ApostateMage As long as your not looking for trophies you'll be fine. Since it does NOT have a separate trophy list for PS4. Its just like REmake where the PS4/PS3 version are now a shared trophy list. @Shigurui The only people who are going to care are the trophy whores. Im sure there will be some that will have to cry about not being able to earn anything. But anyone who honestly claims they love the game so much shouldn't have an issue. Hmm I may have to buy this. It was one my favorite PS2 games. Good game, but after awhile I got tired of drawing those symbols where doing those enough times just made me exhausted and hesitant to push forward. How much is it going for on ps store? Don't really matter though, I'll buy it anyway. Never played this for some reason, looks good. @ellsworth004 Just had a look - £15.99/$19.99. @Quintumply $20 sounds good, u know how big download is, my hd is always completely full. I need to invest in a friggin external HDD, should of done it on black Friday. I'm almost glad I never played this on Wii although it was always on my gotta-buy list. I'll get to play it now. @KratosMD Wonky is the only right way to describe this game. I wanted to play it for a long time. When I finally got it, I just couldn't get past the controls. Played it less than an hour, I think, and never picked it back up. I'm willing to give this game another shot, though.